A stag do. 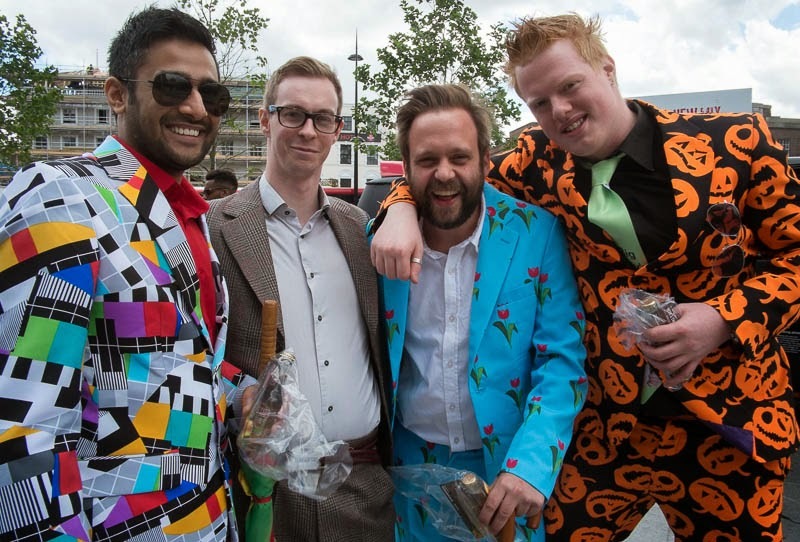 The theme according to the lads is "rubbish suits". Lucky this was early in the evening, there was no doubt it was going to be a colourful night. Those really are some colorful suits! I think they are out for a night of fun! OMG! I think those grins will be pretty hard to muster up come morning :) Fun shot Mo. Ha. Looks like a lot of fun. Oh, I don't think they're rubbish. I love em! Not the thing for the office, though. There's a senile hockey commentator here. He dresses like that. Those aren't rubbish suits! They're pretty awesome! I think I have one of each of those suits in my closet . . .